This article will focus on the demand for convergence of Business Intelligence and Corporate Performance Management tools and why this benefits mid-market companies. The latest release of the Gartner Magic Quadrant for Business Intelligence strengthened my conviction that the market will see consolidation between the Business Intelligence/Visualization (BI) and Corporate Performance Management (CPM) vendors. Gartner classifies them in separate quadrants because the respective tools are evaluated differently during the sales process. Furthermore, BI tools usually sell into marketing and sales teams while CPM targets finance and accounting professionals. Consequently, there has been limited Mergers and Acquisitions (M&A) in the space. Note that this article assumes readers are familiar with the basic definitions to focus on a narrative explaining the demand for their convergence. This article focuses on using dashboards in monthly financial presentations for stronger decision-making. Graphics are everywhere. They are literally everywhere we go, filling our kitchen pantries and even the clothes we wear. Red Crow Marketing Inc. mentions that “digital marketing experts estimate that most Americans are exposed to around 4,000 to 10,000 advertisements each day.” If we’re drawn to visuals, doesn’t it make sense to apply visuals to your financial reports and presentations? Think about receiving multiple pages of spreadsheets full of data. Is this how you best extract your financial analysis at the end of every month? This is where a dashboard comes in handy. Dashboards are defined as charts, graphs, and scorecards that convey data trends, successes, and problem areas with key performance indicators (KPIs), whether you are looking at a store, region, product, and a corporate department in particular, or the entire organization. A dashboard presents key data from various financial and operational sources on a single page, and uses graphs and tables to summarize a large amount of data. In this article, Solver Controller Gina Louie will talk about her experiences in presenting month-end financial presentations to the management team. This article will focus on alternative report writers for Dynamics AX users who share common Management Reporter (MR) issues. 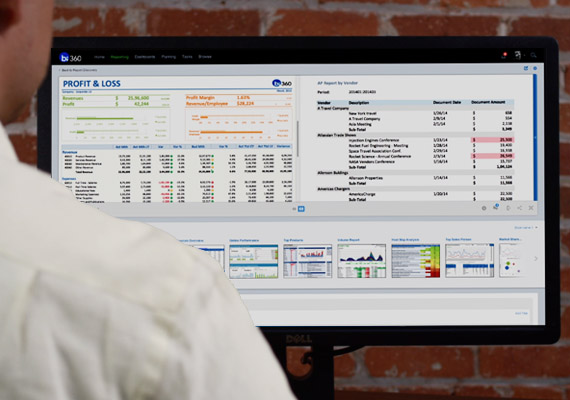 As a regular subscriber to several Business Intelligence (BI) and Enterprise Resource Planning (ERP) user groups, I’ve come across common issues regarding Management Reporter (MR) for those using Dynamics AX. In today’s business world, a modern, dynamic financial reporting tool is extremely important to making smart business decisions while developing your company and brand. This article will discuss the options for investing in a new reporting tool to expand your organization’s Microsoft Dynamics AX experience. This article will discuss the benefits of consolidating your many reporting tools. How many of us use five or more report writers across our business systems? I know it sounds absurd, but most organizations do use that many reporting tools across their ERP system and other databases. When looking to invest in a reporting tool, how you integrate and present your data is very important. It is the backbone when it comes to making wise business decisions. In this article, I will focus on various options for consolidating multiple reporting tools to navigate your organization-specific issues in managing and analyzing your data. This article will discuss the benefits and drawbacks of Sage Business Intelligence and Third Party Solutions. Choosing the right Business Intelligence (BI) solution for your company is a lot like choosing what you need to eat for a healthier lifestyle. Is your company lacking nutrition? What does it need to help that problem and make better decisions? BI is an exciting realm to delve into because it does a number of things. It gives insight into consumer behavior, it improves efficiency, it increases productivity, and it turns data into actionable information. According to Gartner, the world’s leading Information Technology (IT) research company, BI is defined as “an umbrella term that include the applications, infrastructure and tools, and best practices that enable access to and analysis of information to improve and optimize decisions and performance.” The objective is to provide organizations the right knowledge in the hands of the right people at the right time to make informed decisions. BI increases the ability to identify trends and challenges, as well as fine-tune operations to meet business goals. This article will focus on Management Reporter (MR) and the options for investing in a new reporting tool. Management Reporter (MR) is an interactive reporting application that was designed for business professionals that can use the application to create, share, maintain, and view their financial statements. Microsoft offers MR for their ERP customers as a native General Ledger (GL) report writer in Dynamics AX, GP, and SL, almost aided by the more technical reporting tool, SQL Server Reporting Services (SSRS) to solve ERP reporting problems. If you attended Microsoft’s Amplify conference in May this year, you probably have heard that MR will no longer have any major releases, but rather go into maintenance mode with only minor updates. In other words, the product is clearly heading for the sunset. Many companies who have used MR and its predecessor, FRx, are already looking for an alternative. This blog article will zoom in on the concerns regarding the impact of this change and the solutions to these concerns.